A “Black Lives Matter” march against police brutality in Oakland turned ugly, with protesters reportedly attacking a journalist, smashing shopfront windows, throwing bottles, and defacing the main Christmas tree in the heart of the city. Dozens of protesters turned up for the Christmas day “No Time Off” march, which fell under the broader banner of the “Black Lives Matter” protest movement sparked by the killings of Michael Brown and Eric Garner earlier this year. CBS says around 50 protesters gathered at 5:30 pm local time at Frank H. Ogawa Plaza, which was the main protest encampment for the 2011 Occupy Oakland movement. 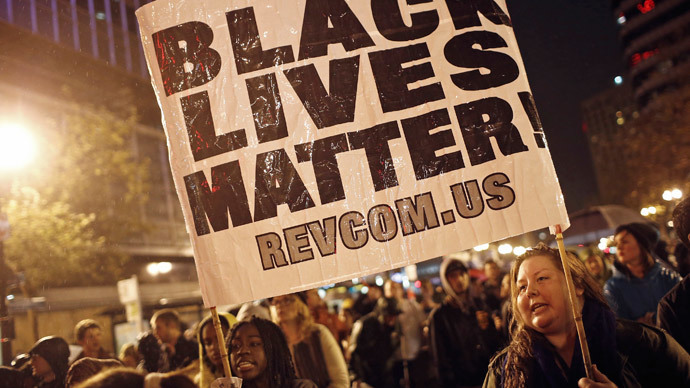 According to the San Francisco Chronicle, the marchers carried a banner reading, “Justice for O’Shaine Evans. No Justice. No Peace,” in reference to a 26-year-old Oakland man shot and killed by San Francisco police in October. The officer who shot Evans seven times said the man had aimed a gun at him. Journalists at the scene said the demonstrators were hostile from the beginning. Although some led chants demanding justice, others cried out “f**k the police” to the officers policing the protest. CBS reported a cameraman for their local KPIX affiliate was lunged at just moments after the march began. Things took a turn for the worse when the marchers arrived at Jack London Square, a popular entertainment and business destination on the waterfront of the city. Some among the dozens in attendance took to vandalizing the area, with KPIX reporting around 30 storefront windows were smashed and liquor looted. The Chronicle reported one of its photographers received an injury to her hand after a protester lobbed a bottle at her. The Christmas tree in the square also served as an easy target for some of the more unruly demonstrators, who tore lights and ornaments off of its branches. Despite the tense atmosphere, the 40 Oakland Police officers dispatched to monitor the protest stood back, following the marchers from the rear. There have been no reports of any arrests. A grand jury’s decision not to indict Officer Daren Wilson in the shooting death of Ferguson, Missouri teen Michael Brown last month sparked a nationwide protest movement against excessive police force. Just over a week later, a grand jury in Staten Island opted not to indict New York Police in the chokehold death of Eric Garner, bringing the phrase “I can’t breath” to the national consciousness. Similar protests were even held abroad. Despite the thousands of miles that separates Oakland from either one of these incidents, it has seen some of the most violent protests over the past month. On December 15, around a dozen protesters were arrested after they chained themselves to four entrances at the Oakland Police Administration Building.